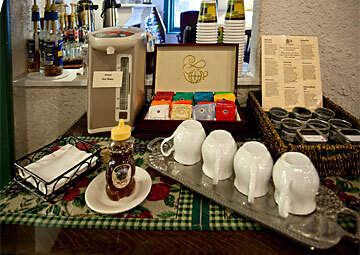 At St Francis Inn, breakfast is an experience. 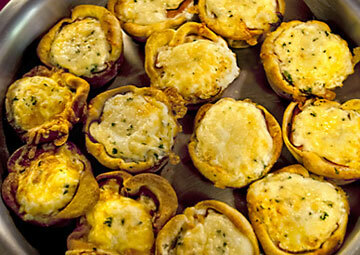 We serve a scrumptious Breakfast Buffet, keeping it as informal and relaxed as the rest of your stay. Guests can stroll down to breakfast on their own schedule, anytime from 7:30am to 9:30am (and an hour later during Extended Brunch on Saturdays, Sundays, and post-holiday mornings). 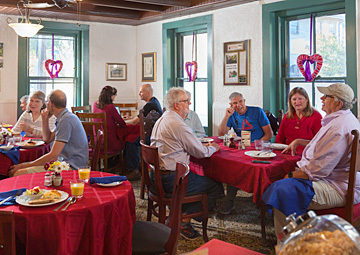 Share the breakfast experience with fellow guests, either in the Inn's comfortable Dining Room, or outdoors in the garden Courtyard. Or, if you prefer quiet time alone as you browse the morning paper, select your own table, or bring buffet selections back to your own room. 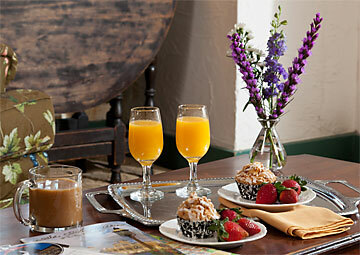 Breakfast for two, served in the guest room or suite, can be pre-arranged, for an additional $25 fee. 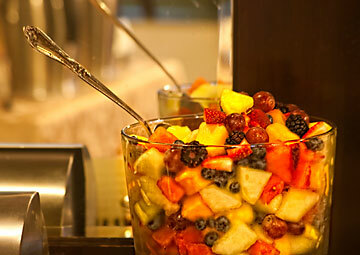 The varied menu of our Buffet Breakfast always includes two hot homemade entrees (varying daily), a fresh fruit salad or fruit soup, fresh baked bread, English muffins, homemade granola, assorted cereal, coffee and assorted teas, fresh juices, whole and fat-free milk, and a full serving of Inn hospitality. Breakfast is served Monday-Friday from 7:30 to 9:30am. Our extended brunch is served on Saturdays, Sundays, and post holiday mornings until 10:30am and includes complimentary Champagne Mimosas and make-your-own Bloody Mary's. 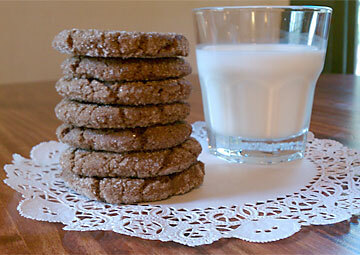 Guests often request Inn recipes, which we hare happy to share. Several of the favorites are listed below. 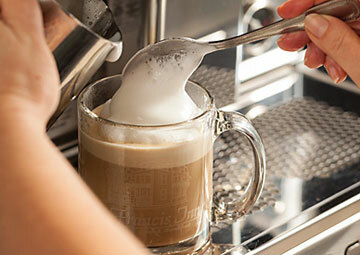 • Enjoy a made-to-order latte, cappuccino or espresso. 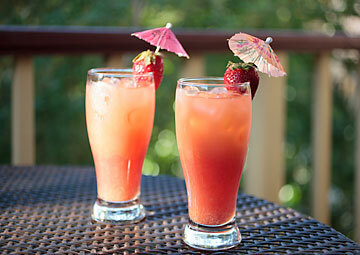 A seasonal special flavor is offered each month. • A complimentary basket of chips, crackers, and snack bars is in the lobby when the front desk closes at night, for guests to help themselves. 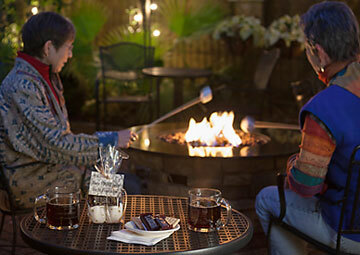 • We are always looking for ways to spark our guests' taste buds, so you might find unexpected treats during your visit. 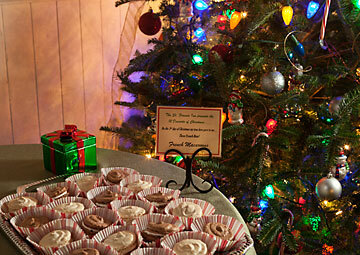 Our "12 Days of Christmas" sweet snacks are quickly becoming a St. Francis Inn tradition, for example. Breakfast for 2, delivered to your room, for $25. Picnic Basket for 2 for $59. It's a great addition to a Beach Day or other excursion around the St. Augustine area. 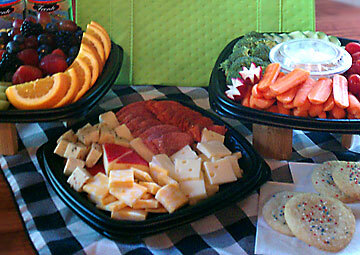 Champagne, Chocolates, Goody Baskets, Cakes, Snack Platters, and other ala carte extras can be delivered to your room. Fees for these special touches are on our Extras page.